The Nitrous Express GM LS 3-Bolt Plate System features a billet aluminum nitrous plate that fits all car and truck intakes with a 3 bolt throttle body. The 78mm billet plate bolts between the throttle body and intake making installation quick, easy and attractive. The system includes jetting for 50, 100, 150, 200, 250, 300, 350 and 400 horsepower at the wheels. This system includes a ProPower Lightning series nitrous solenoid, your choice of nitrous bottle size with the billet aluminum Lightning 500 bottle valve, 6AN feedline, braided stainless solenoid to plate lines, stainless bottle brackets, master arming switch, WOT switch as well as every nut, bolt and electrical connector needed to complete the installation. 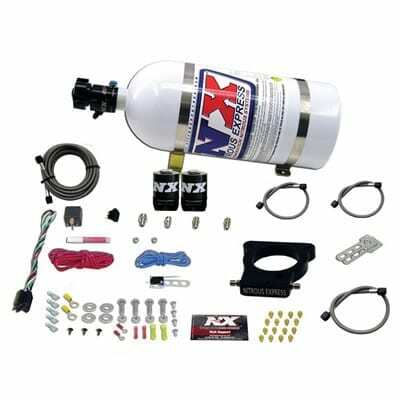 Fits 1997-2004 Corvette, 1998-02 V8 Camaro/Firebird, 2004 GTO as well as 1999-06 GM Trucks with 4.8L, 5.3L & 6.0L engines.